This film certainly caused quite a stir. I had expected something so explosively controversial that I waited on the edge of my seat to be horrified and shocked. What I found was a classic example of a Quentin Tarantino film! I went in to see a Tarantino movie... and that is exactly what I got. I think those who went in to the movie expecting anything different were kidding themselves. I am a massive Tarantino fan. I've seen all his films I have all the soundtracks to all the movies. I'm sad that way, but I can't help it. I find his work so refreshing. His movies don't take themselves so seriously, I find the dialogue to always be brilliant and witty, and of course the action scenes are both grotesque but poetic at the same time! Django Unchained is no different. It features a slave in America, who is bought by an ex-dentist (now a bounty hunter) to help track down three brothers. Although the dentist abhors slavery and acknowledges that he's being a complete hypocrite for partaking in this act of of buying Django for his own means, he promises that when the job is done Django will be a free man. 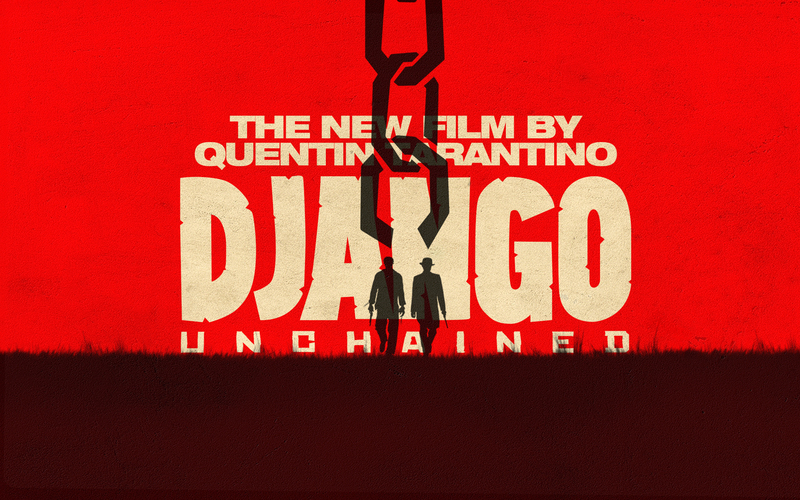 When Django is freed he tells the good doctor that he wants to track down his wife. And that is what they do. Lots of carnage follows of course. The soundtrack was awesome. There were times during fight scenes where Tarantino would just blast a rap tune, or at other times rockabilly type music or gospel inspired songs. It was all simply in his style and fit in a way that only a Tarantino film could pull off. I didn't find the movie as gory as Kill Bill Vol. 1 - 2. I mean, Kill Bill was out of this world in terms of violence and blood. But the violence in Django Unchained was different because the violence was against those who could not defend themselves (such as the slaves), and those scenes in particular were very uncomfortable to watch. Django Unchained is both outrageous and audacious in it's subject matter but it is also a bromance in that it features two men, riding around on horses having strange conversations and looking out for each other. This is something that I feel has been ignored in the reviews that I've read. The movie is based in the south, the pre-civil war south, and features the many different ideas we have about the south in pre-civil war times. Tarantino does not mask the stereotypes but instead takes advantage of them. The film was quite like reading a comic book as are most of his films. 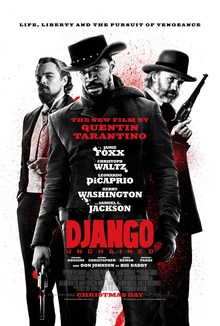 Jamie Foxx, Leonardo DiCaprio and Christoph Waltz are absolutely brilliant and believable and although the rave reviews have all commended Samuel L Jackson's performance I wasn't that keen to be honest as I found his to be the most uncomfortable performance of all. Leonardo DiCaprio's role as the deplorable Calvin Candie... slave owner and Francophile, is pretty amazing. He's just so loathsome and his character did not express ideas or beliefs that were routinely spouted in those times. Calvin Candie holds a particular interest in phrenology (and uses it to justify his views of the African slaves) and also the revolting sport of mandingo fighting. DiCaprio really is scarily believable, and gives Candie a look and feel of a young man who has grown old before his time. Now, I've heard that part of the controversy was the constant use of the 'N-bomb' that littered this film... and it did! It was all over the place. But it didn't seem out of place. After all, it is 'The South', it is pre-civil war times, it is plantation owners and Ku Klux Klan members, and those who believe in phrenology... it is also Tarantino, remember how much the 'N-word' was used in Jackie Brown? Context is important, I feel (not that I believe this film to be historically accurate). I've pored over Quentin Tarantino's defence of this film, I've also read his own very blunt views about how the US is still dealing in slavery (go have a read, his views are intriguing), and he's also pointed his finger towards countries in the world where you can see slavery openly practised. His views, opinions and arguments do not seem to me, to be those of an ignorant fool who has no respect for the past. I thought that this film was good. Very good in fact. I enjoyed the writing, the shooting, the production in general. I enjoyed the performances, the soundtrack and the comic book feel. I also like the trailers. I'm just a teeny-tiny-Tarantino-bopper. Forgive me.